This is a comprehensive food and fitness plan, but I'm mostly in it for the recipes. 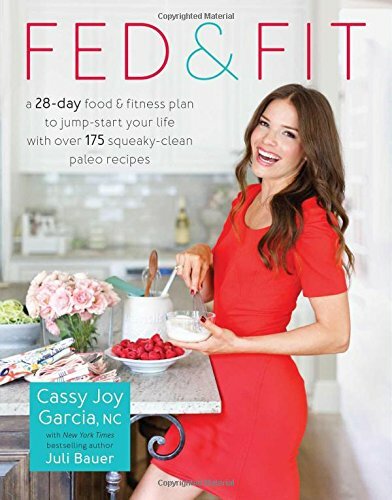 Cassy Joy is the mastermind behind Fed & Fit a blog, podcast, and food & fitness plan aimed to those who want to take control of their health following a paleo approach. I went to a book signing this fall without really knowing much about her, and all you really need to know is that her (middle) name says it all, she is truly "joy"ful—unapologetically upbeat and excited about everything. I dove right in after I got the book. Her book takes us through her own health journey from overweight, overrun, to the healthy person she is today. What I love about this book is that she makes really approachable, crave-able food like carnitas, casseroles, gumbo, taco salad, everything I want to eat when I'm not eating "healthy". Her food is tasty, and the portions are hearty. For the uninitiated paleo eating emphasizes animal proteins as close to nature as possible (grass-fed, free-range), a colorful bouquet of vegetables, healthy fats (like olive oil, coconut oil, ghee), and staying away from grains and seed oils, and essentially anything that promotes inflammation. I don't exclusively eat paleo but I find it healthy for me, and try to make it the basis of my diet and become a bit more strict whenever I feel like I need a reset. I've made a half dozen variations of Chicken Tortilla Soup and this is one of my favorites. The broth is incredibly rich with chicken flavor, thanks to the poaching of the chicken in the broth. I've made this one a few times, and love it the same every time. A perfect balance of brightness and heartiness. This is my go-to pork shoulder recipe. I started making slow cooked pork shoulder a year ago then found this recipe. Its pure magic—the pork is full of flavor and so tender. Make the recipe ahead, then brown and salt right before you eat it, you've got meals for a week: top a salad, make a taco, eat it straight out of the fridge. Okay, okay, calling this a mac & cheese is a bit of stretch since there is neither dairy nor pasta in the dish, but I admit it I liked it a lot. You'll miss the cheesiness of real cheese, but the sauce came together nicely and coats everything evenly. Crispy bacon was a nice savory touch. The grocery store was out of chives, so I added green onions instead, which worked as a good substitute. I woudn't recommend this to satisfy a mac & cheese craving, but I might make the dish again to enjoy as a savory cauliflower dish. I like sweet potatoes, but am not nearly as enamored as the many who follow a paleo diet and eat them as a staple. I modified the recipe a little (maybe thats where I went wrong), I chopped a chicken apple sausage in place of the breakfast sausage. All in all the dish is fine, but the flavors were indistinguishable, the sweet potato overpowering the flavor of everything else, it felt like I couldn't taste the deliciousness of any component. Bonus: I made the paleo sour cream which was a total game changer. For those that want to ditch dairy, this was a great alternative, offering a much more sour flavor than expected. These just fell flat - the egg was too big for the tin. The flavors were too muted. I first added lemon, then salsa to add some flavor, but nothing seemed to revive these. I'm not planning to make these again. She has her own podcast!